This vessel has all the features of a jaguar: ferocious snarling face, sharp teeth, long tail and golden black-spotted coat. 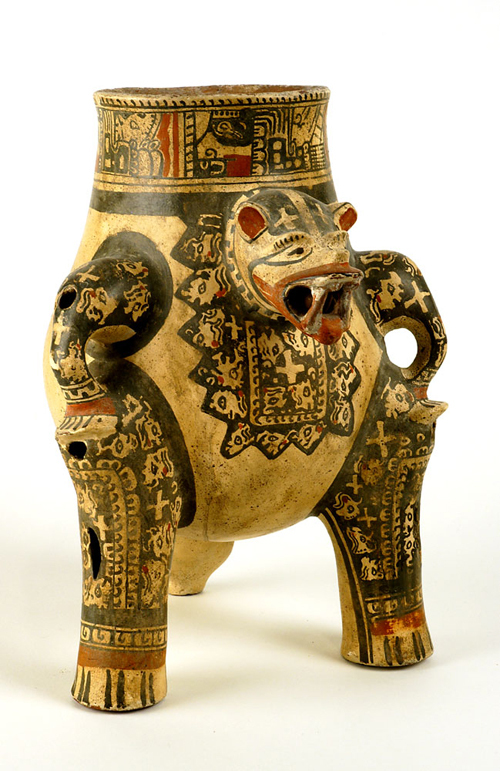 The hollow legs and the mouth contain small clay balls that rattle when the jar is shaken, in imitation of the jaguar's growl. Admired for their strength and agility, jaguars were a powerful and ubiquitous symbol frequently adopted by shamans as an alter-ego. Here the jaguar is depicted in a human-like crouch with the "hands" placed on the knees - a position not possible for this animal. In fact, what we're witnessing is a typical meditation pose of a shaman and the transformation into his/her animal form.